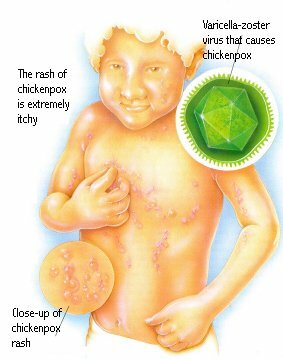 Chickenpox (its medical name is varicella) is a common and contagious disease caused by the varicella-zoster virus. (In later life, a second exposure to this same virus can cause a painful skin condition known as herpes zoster or shingles.) Chickenpox is usually mild, but can have serious consequences. The rash of chickenpox is extremely itchy and can become infected. The virus strikes most often in children between the ages of 5 and 9 and is highly contagious. A new vaccine is available that can prevent chickenpox. It is recommended for most children from ages 12 months to 12 years who have never had the disease. It is also recommended for teenagers and adults who have an unknown history of chickenpox and have never been vaccinated. The characteristic rash of chickenpox can appear in various stages at the same time. Chickenpox can occur at any age, even at birth, but it commonly appears between the ages of 5-9. If one child develops chickenpox, about 90% of others in the household who have never had the disease will develop it. Almost 95% of all adults in the U.S. have had chickenpox. Spread of Chickenpox: Most cases of chickenpox occur between January and May, often in epidemics that sweep through schools or communities. The virus that causes chickenpox is highly contagious and is spread by direct contact, droplets or through the air. The incubation period, or time from first exposure to development of the rash, is between 11 and 21 days. Children are contagious from about two days before the rash appears until all the vesicles scab over. Usually the rash has scabbed over 4-6 days after it appears. Once infected, children become immune to further infection. However, scientists believe the inactive virus can become active again in later life after a stressful event, causing a skin condition known as shingles. Symptoms: About 24 hours before a rash appears, a child may develop a low fever, lose his or her appetite and feel tired. When the rash appears, it quickly spreads from a flat, red rash to individual clear vesicles that are red at the base. In this stage, the vesicles look like “tear drops” or ”dewdrops.” In about 24 hours, these vesicles turn from clear to cloudy, then easily break open and a dry scab forms. New groups of the rash appear over the next 3 to 4 days. Usually the rash begins on the trunk and spreads to the face and scalp. The rash is extremely itchy. The rash may also appear in the mouth and genital area, where they form small ulcers. Treatment: To treat a child’s fever, only non-aspirin products, such as acetaminophen, should be used. It is important to keep the itch of chickenpox under control so that children will feel comfortable and thus reduce scratching and the chance of bacterial infection. Most children will be helped by oral antihistamines that can be given every 4-6 hours as needed. Topical drying agents, such as calamine lotion, can also be applied. The calamine preparations that include antihistamines should not be used if oral antihistamines are being used at the same time. In young children, keeping the fingernails short and using mittens at bedtime may help reduce scratching. Clothes and bed linens should be changed daily, and frequent baths using a drying agent, such as colloidal oatmeal, have a soothing effect. Intravenous acyclovir can be given to children over the age of two years who have a weakened immune system or are taking steroids. Oral acyclovir may be used in children with chronic lung or skin disease, or in teenagers and adults exposed to the disease but who have never had chickenpox before. These patients often will develop serious complications from chickenpox. The acyclovir must be started within the first 24 hours and given 4 or 5 times daily for five days to prevent complications. If an infection develops, antibiotics taken orally must be used. Vaccines: The best treatment is avoiding exposure to someone with chickenpox. One dose of the new varicella virus vaccine is recommended for all children aged 12 months through 12 years who have no history of disease. It should be given to teenagers with unknown history of chickenpox who have never been vaccinated. 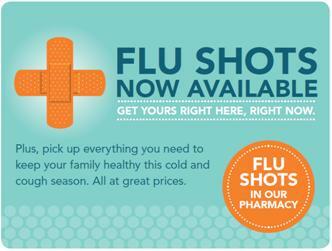 If you have questions about the vaccine and its use, ask your physician or pharmacist.